Produced in their many thousands and hugely popular during the Edo period (1615 – 1868), these colourful woodblock prints, known as ukiyo-e, depicted scenes from everyday Japan. Ukiyo-e literally means 'pictures of the floating world'. 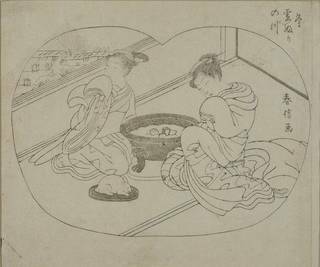 The 'floating world' referred to the licensed brothel and theatre districts of Japan's major cities during the Edo period. Inhabited by prostitutes and Kabuki actors (Kabuki is a traditional Japanese form of theatre), these were the playgrounds of the newly wealthy merchant class. 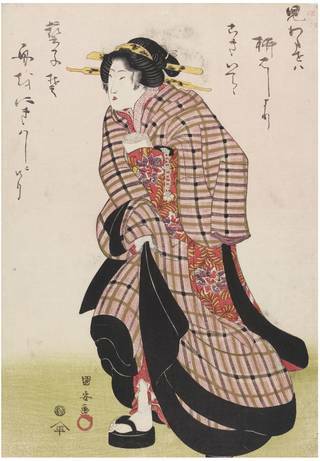 Despite their low status in the strict social hierarchy of the time, actors and courtesans became the style icons of their day, and their fashions spread to the general population via inexpensive woodblock prints. 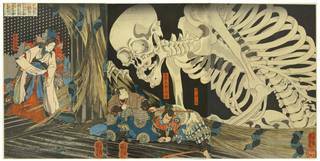 The ukiyo-e style was developed in 1765 and remained popular until the closing decades of the Meiji period (1868 – 1912). While only the wealthy could afford paintings by the artists of the day, ukiyo-e prints were enjoyed by a wide audience because they could be produced quite cheaply and in large numbers. 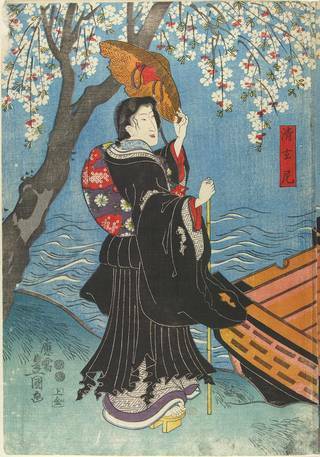 Our Japanese woodblock print collections contain over 25,000 prints and related paintings, drawings and books, covering a wide range of common ukiyo-e themes, including 'beauties' and actors, landscapes, heroic and folk tales, and erotica. 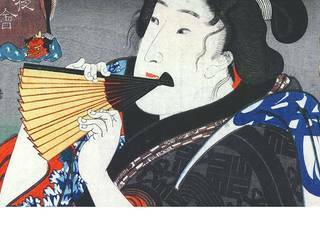 It features the great masters of the genre such as Suzuki Harunobu (1725 – 70), Utagawa Hiroshige (1797 – 1858), Katsushika Hokusai (1760 – 1849) and Utagawa Kunisada (1786 – 1864). 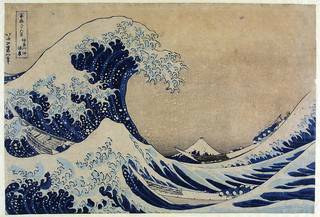 Perhaps the most iconic of all ukiyo-e prints is Hokusai's Great Wave off the Coast of Kanagawa. 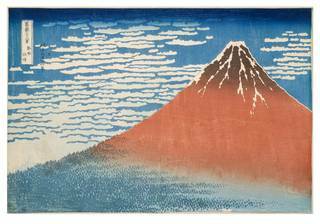 The print, part of the series Thirty-Six Views of Mount Fuji, features a huge arching wave in the foreground which threatens to consume the two boats below, while Mount Fuji sits serenely in the distance, seemingly framed by the wave. Centuries of peace during the Edo period and the development of a sophisticated road system had fostered a culture of leisure travel in Japan. This created a desire for prints of famous and beautiful landscapes which were bought as cheap souvenirs. At the same time, Western imports of prints and drawings represented new ways of looking at the world, which also encouraged an interest in drawing from life. 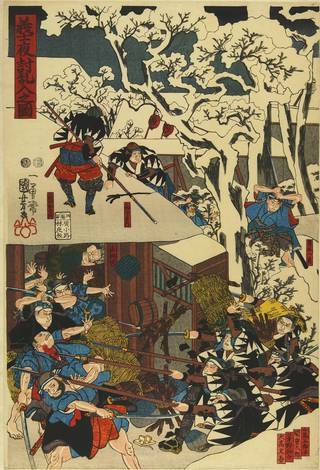 In contrast to portrayals of everday life were the ukiyo-e depictions of heroism and myth. 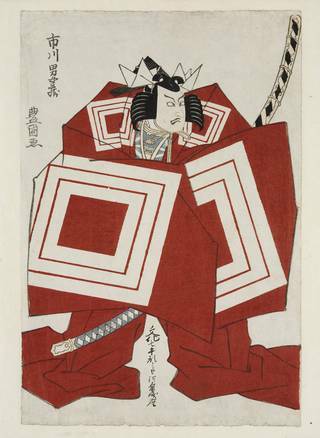 Japan has a long and rich tradition of folklore and storytelling, and traditional tales of heroes and villains, monsters and demons provided dramatic and popular subjects for woodblock prints. Fans were commonplace accessories during the heat of summer, but they were also a popular format for prints. As everyday objects printed on paper, their regular use made them less likely to survive than other prints, however our collection includes a variety of fan prints, with a large number by one of the last great ukiyo-e masters, Utagawa Hiroshige. Designs on fans often reflected the summertime: lively festivals represented in vibrant colours, lighter designs suggesting sun-drenched hazes, or deep blues implying cooling relief. As deeply personal items, the fan designs also reveal the tastes and fashions of the people of Edo period Japan. The earliest woodblock prints were simple black and white prints taken from a single block. Sometimes they were coloured by hand, but this process was expensive. In the 1740s, additional woodblocks were used to print the colours pink and green, but it wasn't until 1765 that the technique of using multiple colour woodblocks was perfected. The glorious full-colour prints that resulted were known as nishiki-e or 'brocade pictures'. The team involved in the production of ukiyo-e was known as the 'ukiyo-e quartet'. It comprised the publisher (who usually had overall control of the process), the designer/artist, the block cutter and the printer. 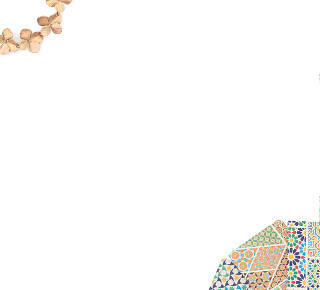 The artist would draw the design on paper. Once complete, an exact copy was made and placed face-down on a cherry wood block. Cherry wood was favoured due to the fine, even grain and consistent density. The block cutter then carved directly through the copy to produce what is known as the 'key-block'. The printer used the key-block to produce a number of black and white prints, from which further blocks could be made for each colour needed in the final print. Known as 'key-block proofs', these prints feature registration marks: small rectangles outside the area of the picture. When the colour blocks were carved, these marks were used to create stops so that the printer could line up the separate colours precisely. Our collection includes a number of copyists' drawings and key-block proofs. Normally, copyists' drawings would be destroyed in the production of the key-block. They are therefore rare survivals of prints that were never produced.